2) 5 Band UNA (United Nations Award) – Plaque. 3) Gold UNA – E-Award & Paper Award. 4) Silver UNA – E-Award & Paper Award. 5) Bronze UNA – E-Award & Paper Award. Worked and confirmed 192 Countries on each 6 HF Bands (160-10m) by CW, SSB, DIGI modes. 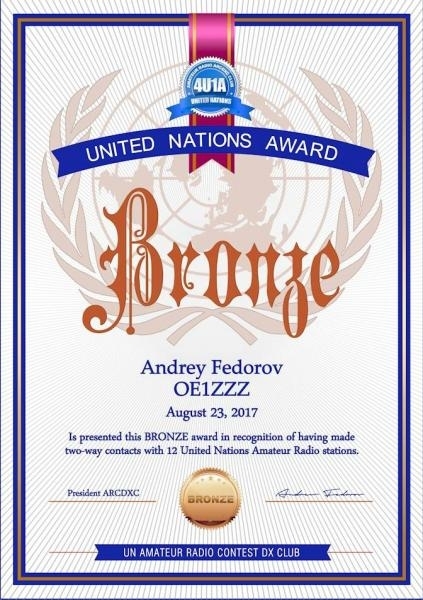 9 QSO with Special UN (4U) Event Amateur Radio Stations. 1 QSO with North Korea (P5) station on any HF bands. Total: 192 Countries on each 6 HF Bands (160-10m) and 37 QSO. Worked and confirmed 192 ( -1 North Korea P5 ) Countries on each 5 HF Bands (80-10m) by s CW, SSB, DIGI modes, Including of any 4U station on each band. Total: 192 Countries on each 5 HF Bands (80-10m). 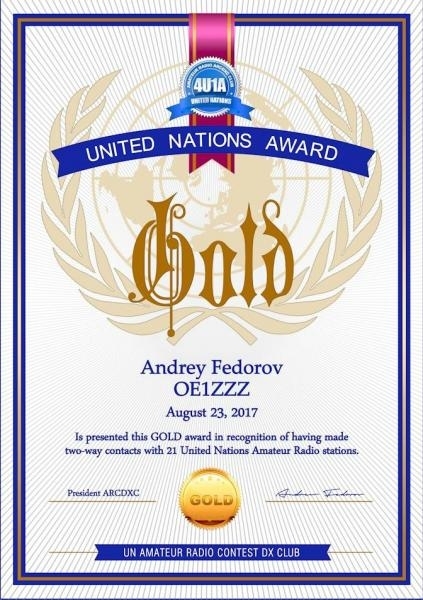 7 QSO with any Special events UN (4U) Stations by s CW, SSB, DIGI modes. 5 QSO with any Special events 4U Stations by s CW, SSB, DIGI modes. 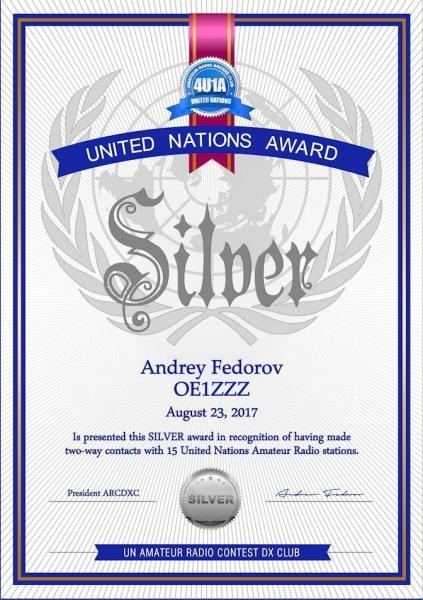 4 QSO with any Special events UN (4U) Stations by s CW, SSB, DIGI modes. 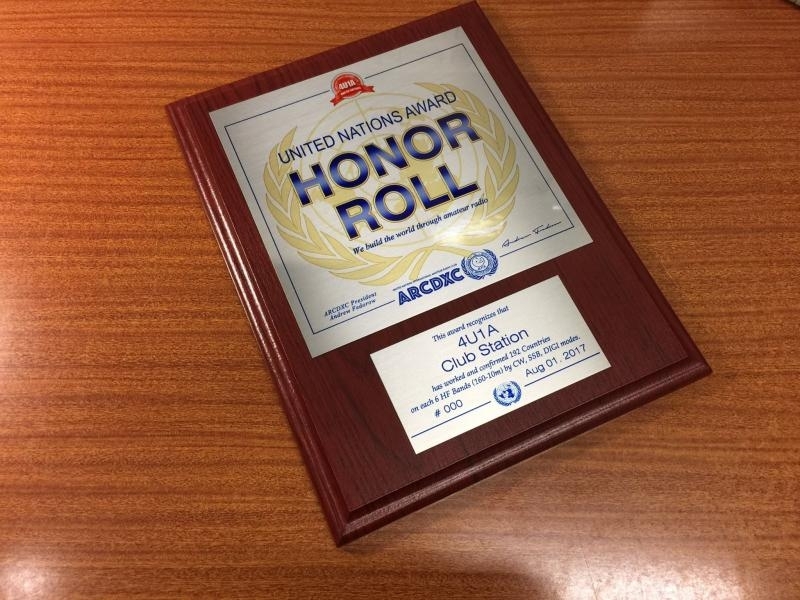 Qualification for the UNA award is based on an examination by the ARCDXC, of QSL cards that the applicant has received from UN stations. See UN stations List below. All QSL cards (no photocopies) must show the mode and/or band for any endorsement applied for.